in the breakfast room . 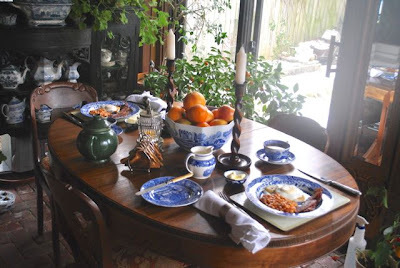 . .
A bowl of Christmas fruit replaces the Advent wreath and the English wood barley twist candlesticks are back on the table -- for candlelight suppers. We're not in England . . . but we can imagine! as to plans for not only the day but for 2013 as well. And it was softly snowing as we breakfasted. It made it even more perfect. This Queen was not in her counting house . . .
And Christmas is still up . . . 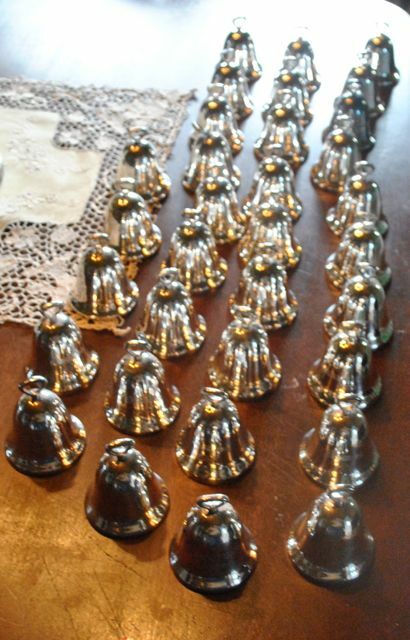 The Reed and Barton silver bells. and still others were gifted from my brother when we used to exchange Christmas presents. So every month I shall order a bell that I don't have. . .
By Christmas next, 44 silver bells shall hang on the tree at Linderhof. . .
An angel gets it wings!!!! 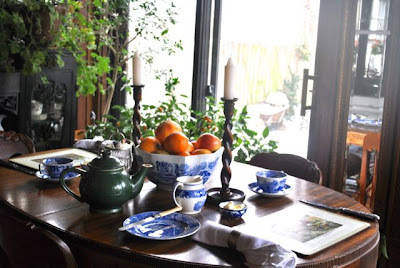 It's Thursday and I'm joining Susan at Between Naps On the Porch for Tablescape Thursday and Cuisine Kathleen for Let's Dish! Oh my goodness, I LOVED this post especially how you ended it. 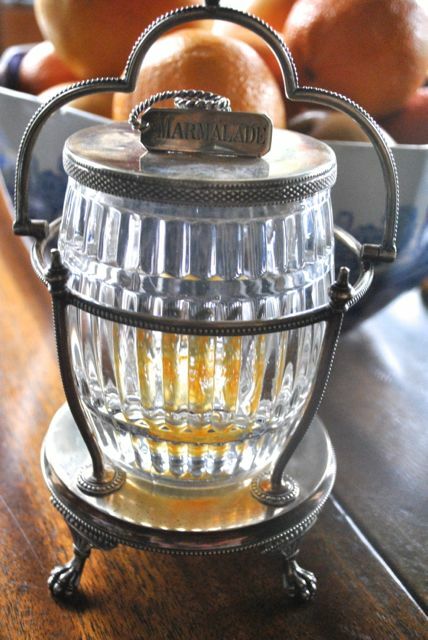 And I am very envious of your marmalade jar, what a beauty. I do wish we had just a little snow here but we don't. We have before but it is very rare. I can remember as a child of 3 a very heavy snow in Pensacola and we have had light snow three other times here that I can remember. I should be careful what I wish for since I did plant my pansy's today so I could enjoy them up until our heat and humidity hits us which is much earlier than y'all have it. That is a sweet tradition. So glad you can get the bells you're missing. What a sight next Christmas when they're all together. Your English breakfast looks delicious...and amazing resemblance to that you photgraphed while in England!!! 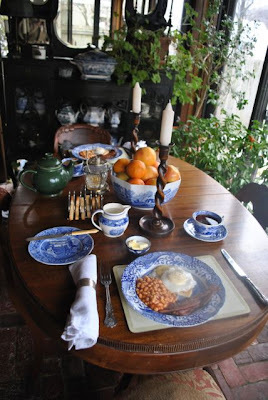 I love the return of your barley twist candlesticks on the breakfast table!!! Your bell collection is elegant! I think it is a wise idea to complete your collection. Sometimes the "thrill of the hunt", but I agree with your decision to order the remaining pieces for completion!!! 2013 has already begun on a sweet "note" @ Linderhof!!! Martha, I loved the ending of your post with the silver bells!! I hope you get them all to complete your set. 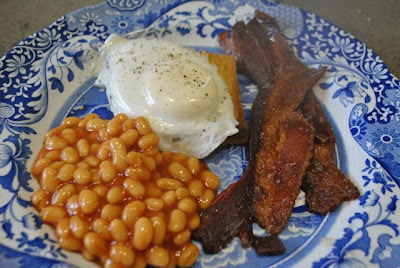 Your english breakfast sounds tasty and the oranges compliment the blue so nicely. Happy New Year!! Martha, the bells are a wonderful tradition. I love the idea of having one for each year of your marriage. Your table and the delicious breakfast make me smile. 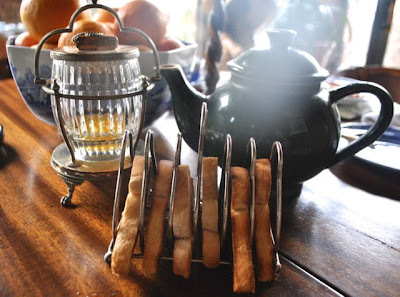 I have a collection of barley twist candlesticks, so it is fun to see you use these on your table too. What a beautiful breakfast and breakfast table! I just adore your marmalade jar! It is stunning! Have you seen the Hallmark Movie called Silver Bells - a favorite one? 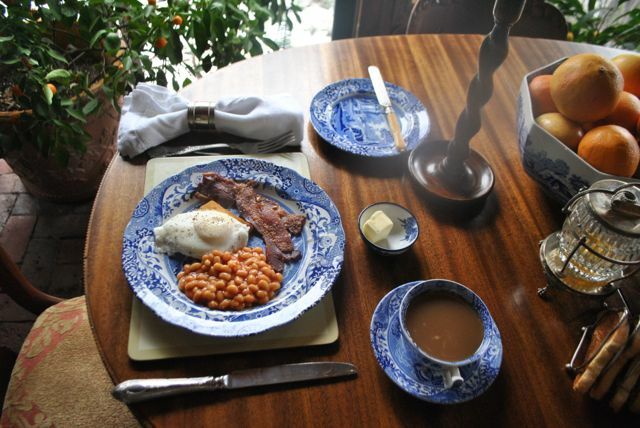 You have quite the collection and what a lovely English breakfast. I love your bell collection! Yes, please, do complete the collection! What a wonderful idea! I bet they look marvelous on your Christmas tree! Everything looks too yummy and delicious! !Great Post! But you might just want to try having the bed and breakfast in Cork , it would be really fun!